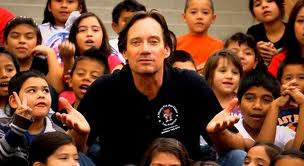 Celebrity English: Kevin Sorbo A World Fit For Kids! Part One Link Kevin Sorbo An Extraordinary Man! Part Two Link Kevin Sorbo on an ExtraordinaryJourney! Alex Graham: Despite a hectic work and life schedule, you have been personally involved in numerous charitable causes over the years and specifically in A World FitFor Kids!, Can you tell me what a World Fit For Kids means to you? Kevin Sorbo: Hercules became huge! By 1996 we had beat Bay Watch as the most watched show in the world! I am on the other side of the world in New Zealand and all of a sudden I am getting inundated with all these…you know it made people pay attention a little bit more. So Make a Wish, Pediatric Aids, all these really good foundations came to me and said that we would like you to be our spokesperson. But I knew people, bigger names then myself that were already doing that kind of stuff. I want to work with high risk kids, in high risk neighborhoods, in high risk lifestyles. I want to keep them off the streets. I want to help teach them about fighting childhood obesity. I want to work with them on their grades, preparation for the real world, work with them for physical education and all that. And this woman at this time who runs the World Fit for Kids! Her kids were screaming for me to be “their guy” because they all watched my show. At that time, the woman that runs the foundation didn’t know who I was but all the kids did. Alex: Wow! That is so cool! What a tremendous compliment! Kevin: So she got a hold of me and there you go. I have been there 16 years now and we are the Number 1 at school program in the state of California every year since about 2004 or 2005 now. And you know we do amazing stuff and every year I go to Congress and I show them the facts and the stats and show them what we are doing with 12 000 kids. For some reason they think they keep needing to add on to stuff. You know here we are in California and we are about to go to 13% tax. It’s insane! Everyone here that is actually paying taxes here is about to pay upwards of what? 55% of their income direct to the government. It’s crazy! Alex: That is such an excellent point about government continuing to add and add rather than clear up some of this mess and just do it. Kevin: Well, there are hundreds of taxes in the last century. It is just unbelievable. But there you go. I am trying to help these kids to let them know that they can lead a better life by not letting other people set their life page. Kevin: Yeah! Look I grew up in large family. I am the fourth of five kids. My dad was basically a public school teacher and my mom was a stay at home mom. And as you know, there is no money in public school teaching. I didn’t come from any money. You know for me, I started my own paper route in 2nd grade for crying out loud. I learned the value of a buck very early in life. Alex: Excellent! All the movies and TV you have done in your career to date are definitely a testament to a phenomenal work ethic. By the way, I noticed you are also on Twitter creating a space for thought and politics. Kevin: Yes, my official twitter is Ksorbs. You know that’s why I tweet. I get all kinds of people pissed off at my posting but you can’t please everyone. I just really want people to think when I get all political. where we are going as country. You know we are following the European model and people need to read about what is going on over there. It isn’t working to well for them there. Alex: I actually follow you now on twitter, face book and TV interviews and I think you are an excellent communicator. You really get your point across clearly. Alex: What can we look forward to from Kevin Sorbo in 2013? Hallmark Channel Shadow On The Mesa! 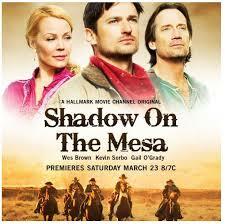 Kevin: Well I have a wonderful western that has just come out called "Shadow on the Mesa". That is on the Hallmark Movie Channel. I start shooting a movie in Dallas this month. They have a couple of different titles for it now so I don’t want to give out a title that could be wrong. And I have got another movie “God is not Dead” which I hope will air before Christmas. It’s a really nice movie. And I have got another movie which is called “Trial by Fire” which is kind of a Karate kid, family type movie. And you know, I am staying busy. And we have a couple more that we are trying to raise money for right now. And that is about it! Alex: Movie after movie! Sounds great! I look forward to seeing both of your new movies in 2013. I am sure they will be big hits with audiences from around the world! Anyhow, thank you very much for your time today. It has been a true pleasure! Alex: Have a good one! For more information about Kevin Sorbo's Phenomenal Charity Check out the video! And or click on this Link: A World Fit For Kids! Twitter is Free and it is easy to sign up and use immediately! Twitter is becoming a common educational tool! It is great for collaborating and you can also use it to find lots of new and natural vocabulary. For example, if you follow Kevin Sorbo you will learn lots of new political language, jokes, Kevin’s projects, things to think about, and much more. Try it out! Have a great week! Make sure to tweet us and tell us where you are from and how you heard about us! Talk to you or tweet you soon!